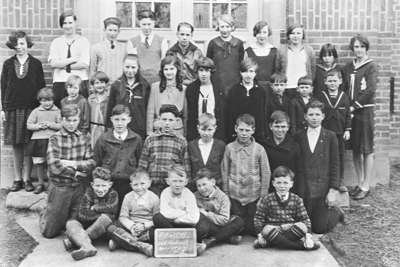 Black and white negative of a photograph showing an image of the students of room two at Brock Street School. The students were photographed in front of the school. Back row: Unidentified, Joan Wilson, Jack Mesher, Cecil Alloway, Bessie Cameron, Sadie Local, Margaret Sleep, Lorraine Gibson, Margaret Kennedy (teacher). Third row: Florena Young, Eleanor Gouldburn, unidentified, unidentified, Elizabeth Southwell, Grace Howard, Martha Crawforth, Erskine Campbell, Donald Pindar, Jim Neal. Front row: Charles Mesher,...Teddy ____ (far right). Brock Street Public School was built in 1916 on the east side of Brock Street south of Victoria Street. Also known as the Bay School, it served Port Whitby until it closed in 1969. The building was demolished in 1998. Brock Street School Room Two Class, 1929, unknown photographer, Whitby Archives, 10-006-015.